Home Educators' Day is an annual event that welcomes the homeschool community and offers special activities throughout Monticello’s Visitor Center and historic grounds. We strongly recommend purchasing tickets in advance, as this is a popular event with limited capacity. On this day, students of all ages can explore a variety of Jeffersonian topics at indoor and outdoor hands-on activity stations, take a special walk-though tour of the first floor of the main house, roll hoops and play games on the West Lawn, hike miles of outdoor trails, learn about ongoing research and new discoveries from Monticello’s archaeologists, and more. Walk along Mulberry Row and download the app Slavery at Monticello: Life and Work on Mulberry Row while visiting recreated buildings and hearing the unforgettable stories of the people who lived and worked on Monticello’s “main street." Explore the David M. Rubenstein Visitor Center including the film Thomas Jefferson’s World, the hands-on Griffin Discovery Room, and innovative exhibitions on architecture, the Monticello plantation and the creation of the United States. Light meals and refreshments are available for purchase at the Cafe at Monticello, and The Shop at Monticello provides shopping opportunities for books and other learning materials related to the exploration of the worlds of Thomas Jefferson. 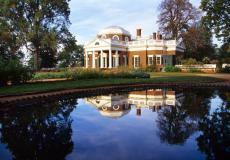 Please direct any questions about the day's content or activities to education@monticello.org.